The Precision Farming Dealer Summit wants to make the conference experience as exceptional for attendees as possible, which is why we offer a mobile app through EventsXD for our 2019 event. This easy-to-use resource can be accessed in the app store on iOS, Android and Windows mobile devices. PLUS, app users will be able to receive real-time event notifications. To enable push notifications, click on the "Settings" icon of the PFDS app's home screen, and check "Allow Push Notifications." Download the EventsXD app from your device's app store. Upon opening the app, you will be prompted to log in. Users with an existing EventsXD account (or EventBoard, the app's former name) can log in using their credentials. If you forgot your password, simply click "Forgot Password?" and enter your email address, when prompted, to reset your login password. You will receive an email with instructions for creating a new password. Once reset, you may log in. If you do not already have a login created for EventsXD (or EventBoard), click the "sign up" button to enter the email address and password you would like to use to sign into the app. Your password should be at least 7 characters long and contain at least 1 special (non-alphanumeric) character. After creating your login, you will be prompted to log in using your newly created account. Access a real-time schedule of events from when registration opens until the final event concludes. You can save a session to your personal app agenda by clicking on the session name and then tapping the star icon next to the name of the session. You are also able to provide feedback on a session once it's over. Interested in certain speakers? You can view a list of all 2019 Precision Farming Dealer Summit speakers and click on their name to view when they are speaking and the topic(s) they will be covering. Looking at the time and wondering where to go next? View the time slots for the conference here, and click on a specific time frame to see what is going on so you never miss a beat. Feeling lost? We have floor plans of all venues where sessions will be held throughout the event. Pull up a Google Map of where the Precision Farming Dealer Summit is taking place, see what area attractions and restaurants are nearby, and navigate your way around downtown Indianapolis. Read about the 2019 event title sponsors and connect with them online. And, be sure to visit their booths on-site to say "Thank You" for their investment in your education! Visit the Precision Farming Dealer Summit website to access every detail you'll need to know for the 2019 event. Join in the conversation on the official Precision Farming Dealer Facebook page, and follow updates from Precision Farming Dealer editors throughout the conference. Join the Precision Farming Dealer LinkedIn group to continue the conversation with other professionals, like yourself. Access a PDF of the conference sessions and scheduled events. Enable push notifications to receive instant event updates from the conference editors and organizers. At the bottom of the app screen, you'll notice three buttons: Home, My Agenda and Pulse. 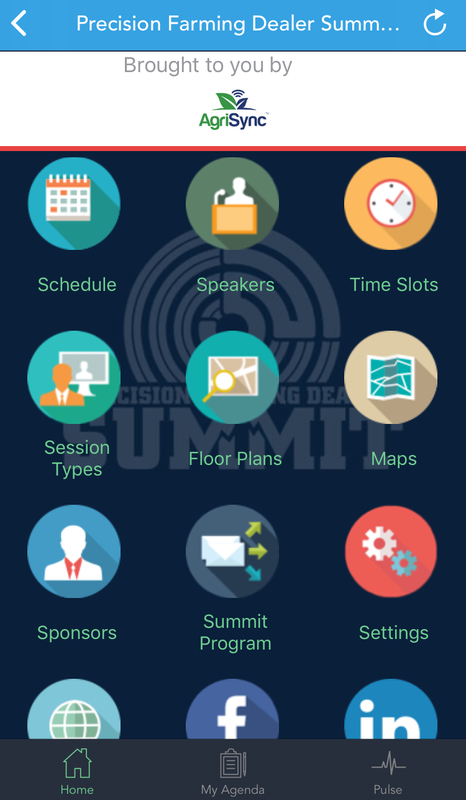 View the home screen of the Precision Farming Dealer Summit app, featuring icons that link you to the various event resources (example seen above). Create your own agenda while you are at the conference so you don't miss out on any opportunities. While viewing sessions within the app, you have the ability to click the green star icon next to a session's name to add it to your own personalized agenda. Click the My Agenda button at the bottom of the PFDS app screen to see the agenda you have created for yourself. Access Conference Updates in the "News" tab of the Pulse section. You can also join in #PFDS Twitter conversations by clicking the "Social" tab of the Pulse section. Finally, the "Notifications" tab of the Pulse section lists any push notifications sent out to users who have notifications enabled. To enable push notifications, click on the "Settings" icon of the PFDS app's home screen, and check "Allow Push Notifications."